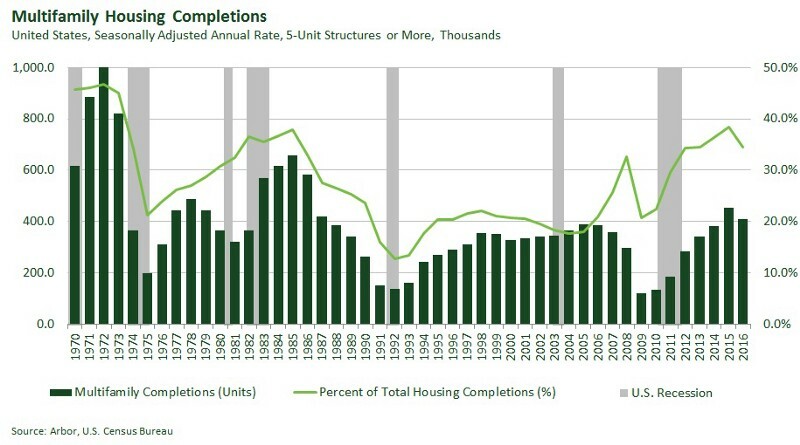 Year-end data released by the U.S. Census Bureau and the U.S. Department of Housing and Urban Development on new residential construction, including data for multifamily buildings (classified as structures with five or more units), showed that multifamily development continued its strong run during 2016. Authorizations of privately-owned residential housing units in the United States in buildings with five units or more were at a rate of 410,500 units at the end of 2016, down from 454,500 units at the end of 2015, and representing 35% of the total housing permits issued. The 2015 total was the highest year-end total since 656,600 units in 1987. The states with the highest total multifamily units permitted were Texas (52,799 units), California (47,964 units), and Florida (37,268 units). Each of these three states were down from their 2015 totals (66,792 units, 49,736 units, and 40,455 units, respectively). 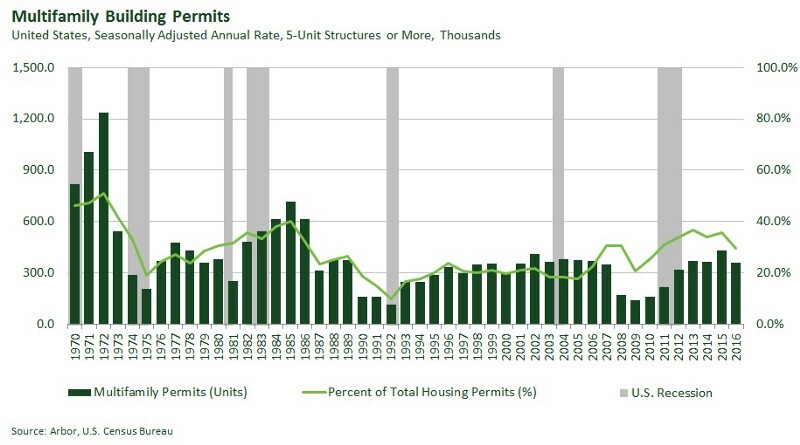 The fewest number of permits were issued in Rhode Island (77 units), Wyoming (85 units), and Maine (288 units). On a local level, the metropolitan areas with the highest total of units were Dallas-Fort Worth-Arlington, TX (25,187 units), Los Angeles-Long Beach-Anaheim, CA (21,174 units), and Seattle-Tacoma-Bellevue, WA (15,148 units). 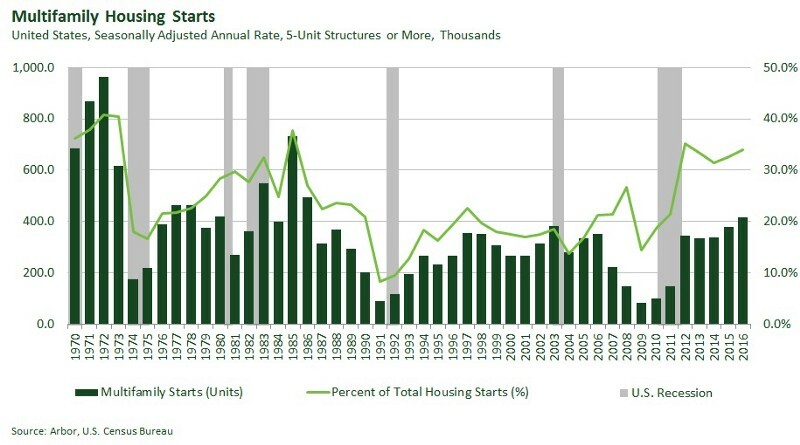 Privately-owned housing starts in buildings with five units or more were at a seasonally adjusted annual rate of 417,000 at the end of 2016, up from 378,000 at the end of 2015, and representing 34% of total housing starts. The 2016 total was the highest year-end total since reaching 495,000 in 1986. Privately-owned housing completions in buildings with five units or more were at a seasonally adjusted annual rate of 355,000 at the end of 2016, up from 316,000 at the end of 2015, and representing 32% of total housing completions. The 2016 total was the highest year-end total since reaching 373,000 in 1988.